Something’s coming. I don’t know what it is, but something’s coming. And we need to be ready to lead, when the time comes. That’s why these huddles, even like this one, down here in Florida, are important. We’re here to help people put their houses back together, but today’s raining. So, we’re going to have Bible camp for adults. We have over 30 guys down here. Dan from North Dakota, fell off a week, and “happened to” land on an air mattress with a chainsaw in his hands. The mattress had blown into that spot weeks ago. Did God know Dan was going to need it? Victor, speaking Texican, from El Paso, gives an update on the Trump rally in Texas last night. I run into a lesbian woman there to support Trump. Huh. I start to have a conversation with the woman on video, and someone walks up and says, “Are you Victor?” They’re from Roswell, New Mexico. From there, they have a friend who is a listener to Pass the Salt Live. The woman says she knows me, from the Pass the Salt Live show. We’re walking down the line, and I took off my new Cross hat and gave it to her, for her husband. The crowd was massive, probably 10-12,000 people. All those people there, was amazing. If we were told the truth, from the media, the tree sets us free. Someone even tried to jump the fence to get in, and they handcuffed him to take him away. The people couldn’t wait to get in. The media is lying to us. The people WANT Trump! 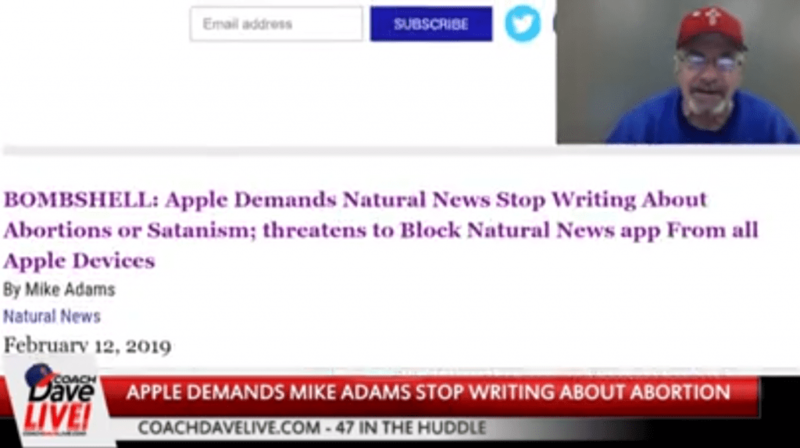 Apple (owned by China) told Mike Adams the Natural News, if he keeps talking about abortion and Satanism, they would de-platform him. They are openly discriminating against moral values. Apple wants the blood of the babies. Satanism occultists sacrifice babies for their blood. They have to have aborted babies, to get the blood. It is evil, but Apple just let the cat out of the bag. He that overcometh, inherits all things. Not everybody. Just he who overcomes. Not everyone who says the sinner’s prayer. We must live for Christ until the end. Satan wants to overthrow the King of Kings, who is supposed to be living in our bodies. The enemy of our souls wants to kill us. Are we fighting the spiritual battle? Are we confronting Satan and sin in our lives? Fight and be victorious with Christ. John is saying in Revelation, “Whoever hears the words of THIS book (The book of the Revelation of Jesus Christ), shall not take away or add to it.” The book he was talking about was the book he was writing. John was talking about the book of the Revelation of Jesus Christ. There WAS NO BIBLE at the time of John’s writing of this book. Keep the pressure on the US Senators to prove Ginsberg’s competence. Supposedly, Ruth Bader Ginsberg attended a concert, but no real photos were shown of her, that could prove it was her. Rumors swirl about her death, or a medically-induced coma, or that she’s home? Where is she? Jamie Walden, former USMC, was a guest on Hagmann & Hagmann. Listen to the clip online. We need to be prepared for the worst of the worst to happen in our culture. Amos predicts darkness and evil. Are we ready to endue to the end? Let’s be prepared.